Kelpie didn’t look at the card between her fingers. She could feel it there, but she was staring at the red splashes on the walls, on the mirror of the wardrobe, across the two paintings, at the blood sliding down them in rivulets. her nostrils flared at the smell from the dead man and she wished she could close them. Kelpie has been living on the streets of Surry Hills almost as long as she can remember. Her friends are mostly ghosts – she alone seems to be able to see and hear them – so she’s no stranger to death, but she is still shocked when she stumbles across the scene where Jimmy Palmer has just been slain. Unwittingly, she is now part of a turf war between mob bosses Glory Nelson and Mr Davidson. She also has a new, unexpected friend and protector – Dymphna Campbell – who was Jimmy’s girlfriend and Glory’s best girl. But Dymphna doesn’t know who to trust: she had Jimmy had been plotting to replace both of the mob bosses, and whoever killed Jimmy must have known that. Jimmy’s ghost wants to help, but he’s a bit hysterical over the turn of events. Kelpie’s only living friend, Snowy, also seems to want to help, but Jimmy says it was Snowy who killed him. Could sticking together be the thing that keeps both girls alive? Set in 1930s Sydney, Razorhurst is historical fiction with a paranormal element, via the ghost characters. Set amidst the backdrop of a period where poverty was high, and gangs focused on prostitution and gambling preferred the razor as a means of enforcement and retribution, the story is fiction, but does draw on the lives of madams Tilly Devine and Kate Leigh, and 1930s prostitutes Dulcie Markham and Nellie Cameron as starting points for the intriguing characters of Glory and Dymphna. Kelpie and Dymphna, who alternate as viewpoint characters, seem initially to be two very different people thrown together by circumstance, but it emerges that they have more in common than either thinks. this makes their relationship both complex and, for the reader, intriguing. The events that they endure, both within the short time frame of the book and in their pasts – which we see through flash backs – are violent and traumatic, yet both girls are strong, albeit in different ways. Razorhurst is absorbing, frightening, and, at times, amusing. It is also utterly readable. Fish that fly through the sky , gargoyles that come alive and drink cups of tea, and cats that play chess are just a few of the wonders that populate the pages of this fantastical, magical yet gentle book. The poetic text is minimal – just a few words per page – and invites readers to use their imagination. The illustrations, in black pen and ink on cream backgrounds use light and shadow, and lots of cross-hatching and detail, to amazing effect. There is a historic feel, with steam trains, historical figures and buildings and of course the lack of colour all enhancing this, but it doesn’t feel dated. Rather, it seems the children pictured are in a time slip adventure, taking the reader with them. The design of the book is also special. In clothbound hard cover, with embossed text and a panel print illustration, the endpapers also use red ink rather than the black of the rest of the book. The whole feels sumptuous and a real keepsake. Imagine a City would make a perfect gift for a child or an adult. 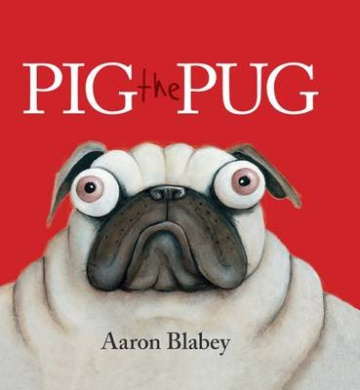 Pig the Pug lives with a gorgeous sausage dog named Trevor, but in spite of Trevor’s attempts to play, Pig is never nice to Trevor, until his efforts to keep all his toys to himself result in a terrible accident. Pig the Pug is a funny story in rhyme about greediness and sharing – and dogs. The message is clear, but doesn’t get in the way of a simply entertaining, fun story. The illustrations, in acrylic, bring the two dogs to life. In spite of his greedy nature, Pig is an adorable pug, with a gorgeously expressive face, and Trevor, too, is endearing. They fill the pages, so there is little need for excessive detail. The simplicity of the illustrations allows the dogs’ expressions to tell the story. The looks on both dogs’ faces after the accident says so much – Trevor looks innocently smug at the turn of events, and it is clear that Pig is not happy about the sharing that has resulted. Wombat stared in surprise at the other animals. Am I special after all? When Wombat emerges from his tunnel, his friends are really glad to see him, but as Wombat watches them celebrate he feels sad. Each of his friends is good at something: Goanna is the fastest climber, Magpie is the best singer and Dingo is the cleverest dancer. Wombat wants to go back and hide in his tunnel, but his friends run after him to remind him that he, too, is good at things, and best of all, that Wombat is their friend. 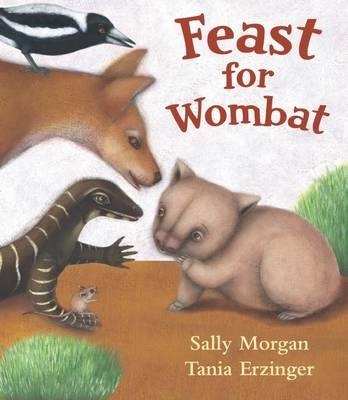 A Feast for Wombat is a gentle tale of friendship and self belief. While Wombat wants to be like his friends, he seems unaware that each of them is different, as is he. His friends’ reminder of his own strengths is reassuring, and will reassure young readers, too. The acrylic illustrations bring the cast of Australian animals to life in gentle bush colours with lovely textured backgrounds, adding to the warm feel of the book. Walking on Shell Beach with their people was slow and strange. The jangle of voices filled Nim’s ears so she couldn’t hear the cry of birds or the shushing of the sea. Her toes didn’t notice the warm sand beneath them. But most of all her mind was too busy noticing what other people were doing to think her own thoughts. Nim has always liked living alone on her island with her dad Jack, their writer friend Alex Rover and her animal friends Fred and Selkie. Visitors are not wanted, because they might want to damage the island. But Jack has invited some special visors – scientists who will work with him to try to find a a source of safe energy which might help the whole world. The scientists are bringing their children, and Nim’s friend Edmund, and Nim thinks it might be nice to have some company for a change. But when they arrive, Nim isn’t so sure. The twins Tiffany and Tristan think think the island is boring, and one of the pairs of scientists is not the couple they invited. Could they be up to no good? Rescue on Nim’s Island is the third book featuring Nim and her unusual friends. The island is a magical, idyllic place, and in previous adventures Nim has had to fight to save it from tourists and developers. Now, it seems its treasures are attractive to would-be scientists. Nim has to use all her ingenuity – and the help of her friends, animal and human, to save the island and outwit the crooks. As with instalments of most good series, Rescue on Nim’s Island can be read on its own, with enough back story given to keep a new reader abreast of what’s gone before, but reading the books in sequence will add to the experience. Snail and Turtle are friends. They like to spend time together, walking and running and being quiet together. But they are also very different: Snail eats leaves, while Turtle eats flowers; Snail likes to climb while Turtle loves to dive. Difference, though, doesn’t mean they can’t be friends – they can do things together even when doing them differently. 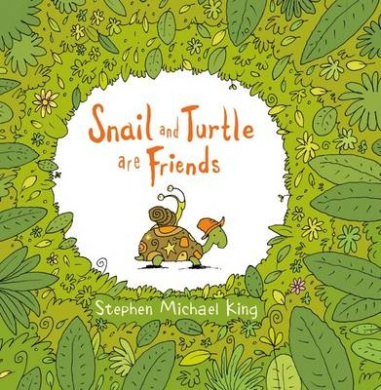 Snail and Turtle are Friends is a divine celebration of friendship and difference and whimsy told with the simple brilliance we’ve come to expect from Stephen Michael King. There’s no need for overt explanation of what’s going on – the minimal text and the delightful illustrations work together to have the reader smiling and nodding throughout. Visually, the characters of Snail and Turtle are created very simply, and complemented by a cast of other animals and insects who appear in the illustrations but not the text. Their landscape is green and lush with hints of seasons passing through rain, flowers and autumnal shades on different spreads (though the latter are attributed to the creative efforts of the pair). Young viewers will enjoy spotting embellishments and details throughout. This a totally huggable book. The girl had lost her way. 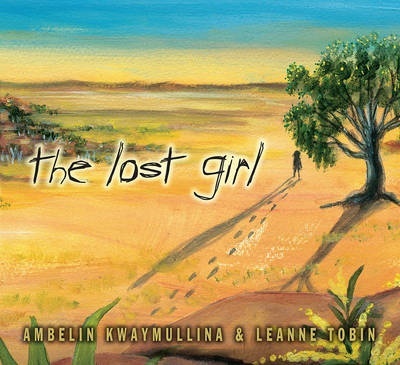 The Lost Girl is a lavish book celebrating indigenous culture and Australia’s natural environment, as well as the bond between the two. The story is gently told – young readers will fear for the girl, but visual clues form the start make it clear that she is no in danger. instead, she is surrounded by animals and plants which offer her company and protection. The illustrations, painted in acrylic, use rich natural colours – ochres, greens, golds and silvery greys. The beauty of the scenery is well captured, as is the joy of both girl and family when they are reunited. A beautiful offering for home or classroom. Almost one year ago I arrived in this colony on board an English transport. I am about to leave on board a French discovery ship…the Geographe…a journey I cannot fathom. It is 1802 and fourteen year old Mary Beckwith is struggling to adjust to her new life. She and her mother have been transported for life to New South Wales, for stealing fabric. Assigned as nursemaid to a judge’s daughters, Mary tries hard to settle down and do her job, but it isn’t long before she falls foul of the lady of the house, and is sent to serve a French explorer, Nicholas Baudin, who is visiting the colony. Soon, Mary is travelling with the explorer, also crossing paths with Matthew Flinders as the two explorers make their Voyages of Discovery. Convict Girl , part of the My Australian Story series, is a diary-format tale. As such we are offered insight into Mary’s thoughts and motivation, including her mixed feelings about what loyalty and honesty really mean. Set in the early days of the colony, readers are taken inside the life of the times, and issues such as the treatment of Aborigines and of convicts, as well as the journeys of the two famed explorers Baudin and Flinders. A wonderfully accessible way to explore Australia’s history, the series is suitable for primary aged readers and younger teens. Lilli-Pilli is very excited. Mum is going to have a new baby, and Lilli-Pilli is sure it will be a sister. But as she helps to collect soft things for the baby’s cradle, her friends and family remind her that the baby could actually be a brother. Lilli-Pilli says she doesn’t mind, but could her senses be wrong? When she returns home, there is a surprise waiting for he r- in fact two surprises. She has a baby sister and a baby brother. Lilli-Pilli’s Sister is a delightful story about new siblings, friendship and family. Lilli-Pilli and her parents are beautifully contemporary fairies, living in an Australian bush setting. Illustrations are whimsical but not saccharine, in watercolour suitable for the gentle nature of the story. Suitable for any fairy-loving youngster. when they jog around the track. so she dresses up in black. All nannas are different, but when your nanna is a ninja, she does super different things, like juggling ninja stars and eating with swords. Still, even a ninja nanna can do ‘normal’ grandmother things like kissing a grandchild goodnight, though she might do it very quietly. 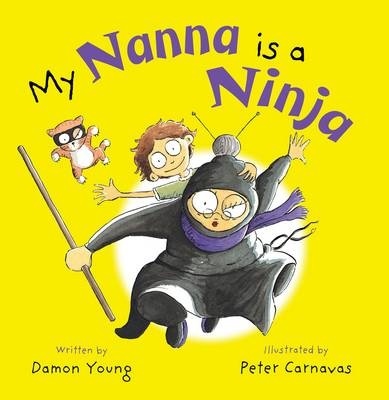 My Nanna is a Ninja is a humour-filled picture book in rhyme, celebrating difference, the grandparent-grandchild relationship and, of course, ninjas. The text flows freely, and the humour of Nanna’s actions will amuse. The illustrations, in ink and watercolour have all the whimsy we’ve come to expect from Peter Carnavas, an the use of sepia washed frames to show the things Nanna does when the child isn’t present is a clever technique. In hardcover with a gorgeous bright yellow cover, My Nanna is a Ninja is a celebration of non-conventional grandparents.